The most Southern Part of Terra Firma in Singapore territory. Or more commonly known as Raffles Lighthouse. Once again we were indeed grateful for the permission granted to us to do an exploratory intertidal walk on Pulau Satumu which is a restricted area. Previously when we did our intertidal walk, we managed to see many Criniods (Feather Stars) in different colours. 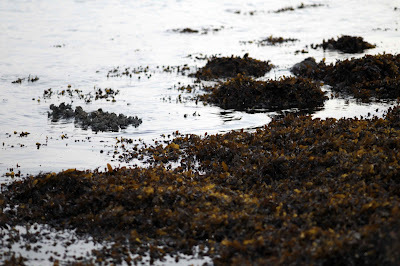 However, this time - the marked difference that I noticed was the numerous Nerites (Snails) that were on every rocks that we walked, and the other was the Sargassum (Family Sargassaceae) that has covered much of the intertidal areas. 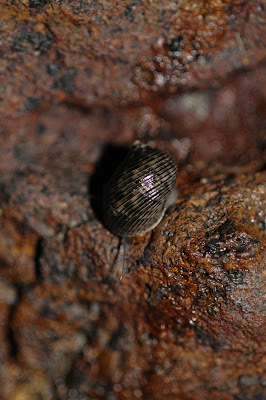 Nerite scavenging for foods on the rocks. 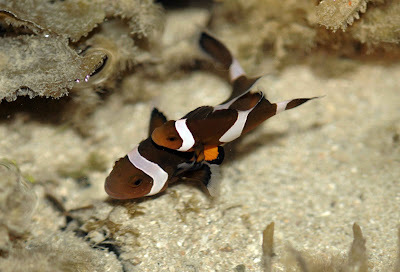 Stranded in some pocket of water, we found these two False Clown Fish (Amphiprion ocellaris), near to this pocket of water was another pocket with a Sea Anemone. Apparently, they must have strayed and landed themselves from their host. Well the next tide will bring a sweet union to these dual. While scouting around, I chanced uon this "split" coral. I have read that as coral grows, the individual polyp will raise its base plate (which is the bottom of the coral cell), and start to build the calcium wall around it. But that is from book, now from the "split" coral, I was able to see the formation of the individual walls of each of these polyps. Why did the coral split? It does not look like a mechanical damage, but somehow it showed that two sides of the corals decided to go their separate ways! Any Coral experts, maybe you can enlighten me on this unusual sighting. Refer to Ria's reply below. This is a Zoanthid, my hand must be numbed on that day, as I touch the split zone and felt that it was hard. Thanks to Ria for the correction. 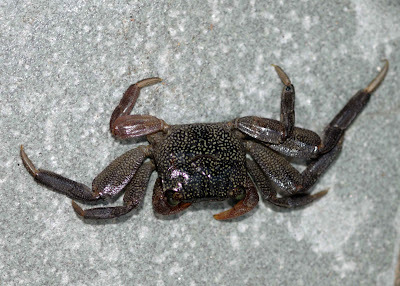 The uniqueness of this crab is that it has yet to be ID, and thus has no names (scientifically or common). Its cousins have been seen in Indonesia, Taiwan and Japan, except that in Taiwan it has blusih dots instead of the greenish dots. With these instructions, we went a hunting - alas, we were bad hunters and found none. But the expert managed to land one, and we managed to take a lot of closed-up shots of this female "model". 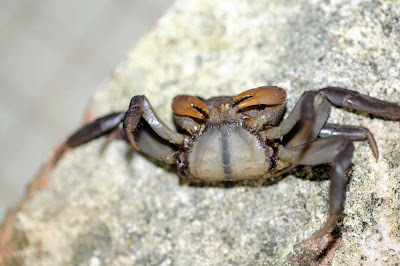 It has lost one leg, and we were told that crabs have certain set of muscles near to the body. Upon being threatened, they can constrict this muscles such that the legs can just dislodge itself. Possibly just like the lizard's tail whereby losing a limb (which can grow back in the next moult) is more beneficial than being eaten up. Upper picture taken, showing the almost squarish carapace with yellowish-greenish dots. 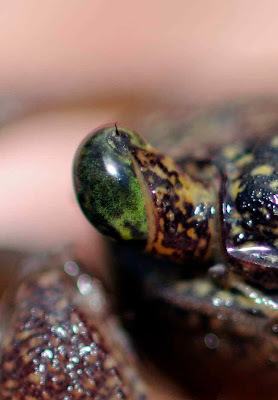 Close up of the eye - notice that there is a protrusion on the eye. 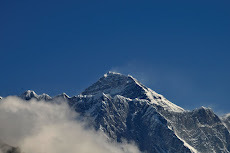 This is like a hair on the eye. Underside of this female unknown ID crab with its orange claws. 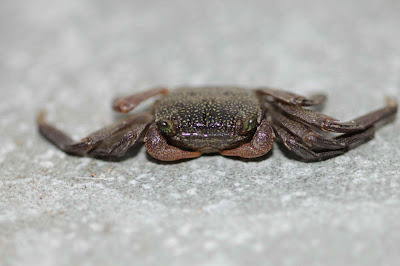 Till the ID of this crab is published, I think I am at liberty to call this crab "Jaded Pearls" Crab. Jade tends to be green, and the dots are like pearl. 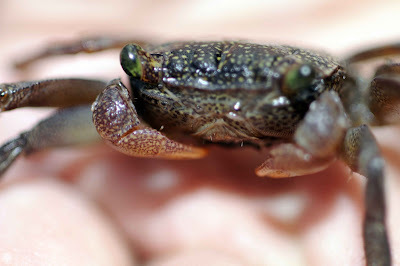 So Jaded Pearls Crab in this blog. The next time to Satumu, I will be looking up for more Jade! Thanks for sharing about Jaded Pearl! An interesting crab indeed. 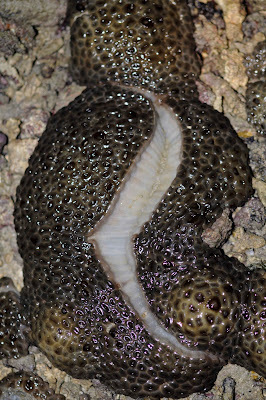 Regarding the 'split coral', the animal in your photograph is a zoanthid, and looks like Palythoa tuberculosa. Zoanthids are NOT hard corals and don't produce a hard skeleton. Here's more about zoanthids and what we learnt about them from Dr James, the zoanthid expert who visited us in June. Thanks Ria, for the correction. Must hit the shore to learn more, in between my flying.